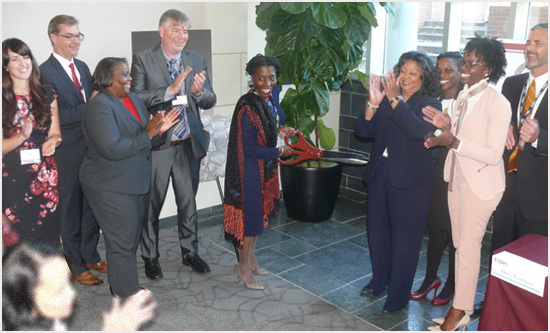 On October 18, 2017, practitioners from Fish Richardson, Jones Day, SAS, local patent attorneys, students and faculty gathered for a welcoming ribbon cutting ceremony to launch the new Post Grant Pro Bono Project. In attendance were representatives from elected officials, members of UNC’s board of governors and alumni supporters of the NCCU School of Law. North Carolina Central University School of Law’s (NCCU) Intellectual Property Law Institute has launched a Post Grant Pro Bono Project, with the assistance of Fish & Richardson and Jones Day law firms, to provide minority law students with immersive, hands on training in prosecuting post grant matters. This first of its kind program was created to encourage true innovation, support a more diverse bar, and provide minority law students with valuable skills that have broad applicability for today’s employers. Experienced post grant practitioners from Fish, Jones Day, and SAS will share their’ in depth experience with NCCU law students and provide direct training in post grant proceedings which would occur before the Patent Trial and Appeals Board.